EDIT: I have a case pictured below. Now I need the part ZERO8RACK and cannot find it anywhere. I called Korg, Korgparts.com, and many stores. I cannot find the part anywhere. I was wondering if anyone out there used different rack ears for their Zero8's? Sam Ash sells some rack ears that might work, but I wanted to get people's opinions first. Also if anyone wants to sell me the official zero8rack with all the original screws and such, I am interested. I've asked the same question everywhere but no one was able to answer. My guess is factoring in the dimensions of the Zero8 your best bet will by a case by Odyssey called FZGS10, that happens to be the one in that picture! I've been meaning to buy one forever myself!! Check eBay for the lowest I've seen is 230 US on there and up to 300 everywhere else. 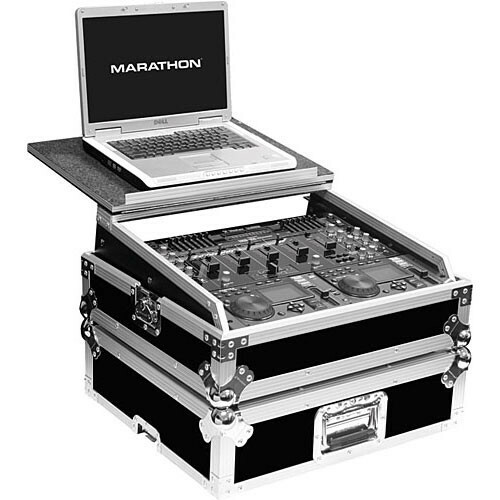 Well, I ordered the Marathon flight case pictured. (Only it's the black series) And now I am on a search for the rack mount (Model# KorgZero8rack) that support the zero8 in a 19" case like the one shown. I will post in a few days after I find the RAck Ears made for the zero8. I hope it works, I love the case. Ha! I failed to realize you need rack mounts also to have it mounted inside the case?? Can you get away without them? It could be a loose fit therefore can't transfer the mixer in there without bouncing around...? Where do you find those zero8 specific rack ears?? Nobody has the rack ears in stock. I cannot find them anywhere. I called Korg, KorgParts.com, and numerous stores. Korg Parts told me they were discontinued. Now I am stuck with the case, and no way to put the mixer in properly. If anyone has a pair of the official rack ears (Model# KorgZero8Rack) I will buy them through paypal. Or if anyone knows of a local store that is selling them, please let me know. I would really appreciate it.